I'm sickened by the vote to make Brett Kavanaugh the new Supreme Court justice. I know you are, too. The Republicans clinched it, and they want us to know there is no action, no protest strong enough against them. We can't win. They hold all the power and they're looking for more. Nothing humanly possible can stop them when they're on a mission. They own us. Lock, stock, and barrel. The thought of making us miserable comforts them. Millions of people protested this vote. Thousands of lawyers warned against it. Twenty four hundred law professors warned against him. An ex-Supreme Court justice, John Paul Stevens, warned against him, citing Kavanaugh's temperament, if nothing else. Judges, senators, representatives, governors, mayors, women's groups, the ACLU, dozens of newspaper editorial pages--all begged the Senate to vote no on Kavanaugh. Every Republican in the Senate gave them no heed, including Susan Collins, Lisa Murkowski, and Jeff Flake, who all pretended it was a decision most wrenching for them. In the end, two of the three did what they were always going to do--they gave him their vote. Murkowski voted "present" in order to protect the "yes" vote of an absent Senator. They weren't cowards, they were collaborators. In doing their dirty work, they twisted the knife already long embedded into Dr. Christine Blasey-Ford's gut by publicly scolding her for causing so much trouble. In the end, with no proof of his innocence, with still unchallenged money problems, with only a handful of requested documents provided to the Democrats, with hair-raising real-time public rages, with biases against anyone not leaning to the Right, all while waving his entitlement like a huge red flag, the Republicans, to a person, opted to push through Brett Kavanaugh. 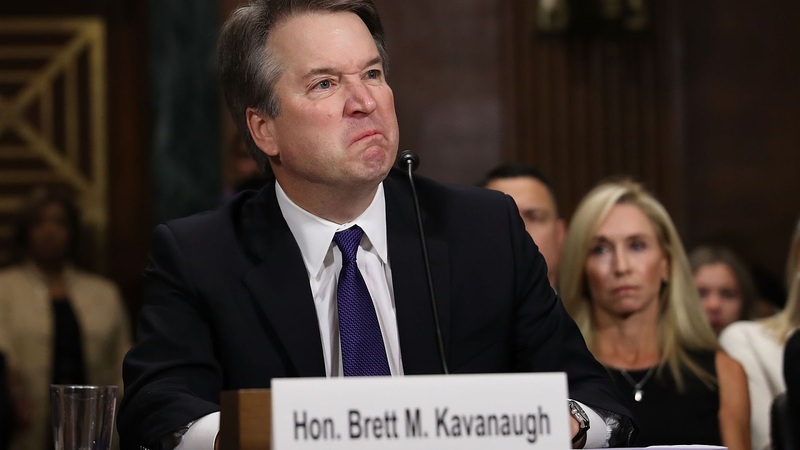 He lied under oath, behaved like a child, battered the committee with preppie privilege, and snarled at anyone who asked him something he didn't want to answer. And none of it mattered. Trump got to put through TWO Supreme Court justices, one of whom was clearly unfit and unqualified, the other one almost sure to go along with killing off Roe v Wade. So, yes, I'm going there, and to hell with anyone who feels offended: None of this would have happened if Hillary Clinton were President. None of this would have happened it the Democrats had taken hold of Congress. The Republicans are gloating while we, their opposition, are pained and embarrassed and scared. Terrified children separated from their parents wouldn't be crying in cages. Insidious Russian influence would have been nipped in the bud. The vicious Religious Right would be mere voices in the wilderness. We would be kinder, gentler, more inclined to work on essentials like health, welfare, foreign relations, and infrastructure. Corruption in our government wouldn't be rampant. And Donald Trump would go on being a buffoon, but without an ounce of power. This is wrong. So wrong. Everything about Trump's regime is wrong, but our fight against him gets us nowhere. We'll have a chance at fixing some of this in November. All that's required of us is to vote. We have to vote Democratic. If you just can't do it, and the Republicans win again, they won't thank you. When they're done with you, you'll be right back where you were before. Or worse. Right back with the rest of us. And we won't be happy to see you. This is what absolute power without care or conscience looks like. We have the power to change this. It starts in the voting booth. Vote as if this is our last chance. It just might be.